Thank-you Toni for doing this meme, if you didn't I probably wouldn't even post. Well, Josh was sick last week. I went to pick him up early on Thursday, he had a temperature of 101.6 and had body aches and a sore throat. We took him to urgent care on Sunday and his fever had broke and the body aches were gone. The doctor said it was a viral infection and he tested negative for strep and mono. I let him stay home Monday and he was supposed to go back today, but he wanted to stay home, he said he did not feel well. I would have made him go, but he told me this about the time we needed to go. Anyway, he is going tomorrow. I think he just wants to stay home. The doctor said on Sunday he could go back to school on Monday. My mom's second or (Left eye) surgery is tomorrow (Cataract). She has done very well with her other eye, so I hope this one goes just as well. I am sure it will. I believe she told me her surgery was at 7:30AM. She will be here at 5:15AM and we have to be there at 6AM. 1. What's the oddest thing you've ever returned? Hmmm, I so rarely return anything, I cannot think of anything. 2. Do you return things you don't like or just keep them? Just keep them. I am careful with what I buy though. 4. Have you ever returned a dress/outfit you wore to a special occasion? Oh no way. 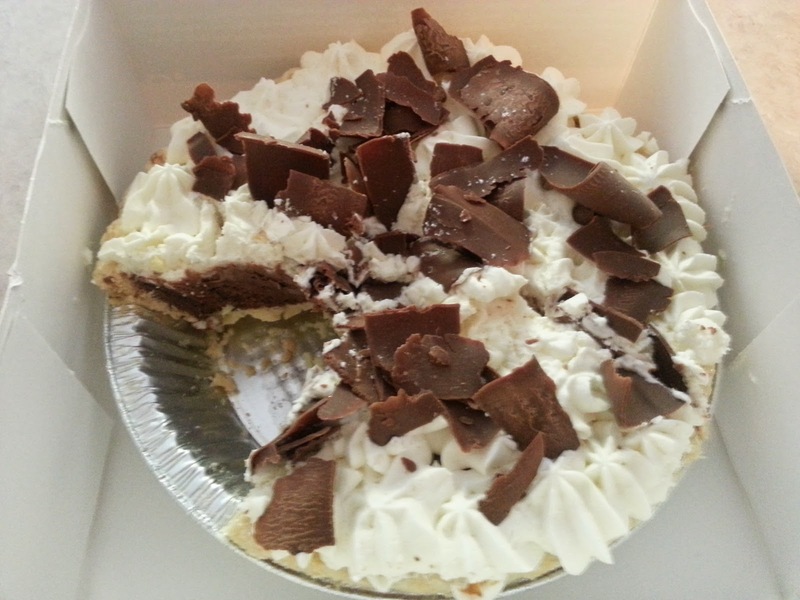 Well, today is my birthday, the girls at work got me French Silk Pie. It is kind of a tradition. One of my workers kind of slurs her words together sometimes and she was talking about French Silk Pie one day, but I thought she said "Frendship Pie"...well thus "Friendship Pie" was born and we have it for every birthday and sometimes if we are just stressed out. It was very good. It was from Village Inn. My co-worker who decided to stay home this year to be with her kids came by too and brought me lunch. So sweet. We are going out to eat for dinner also. I have had enough to eat already today. Maybe we should go tomorrow. My mom's surgery went great. I take her to the doctor again this Thursday for another check-up. She is doing fine, the doctor said last week her eye looked really good. My dad is doing the drops this week as I am back at work. She told Josh last night he was doing good at putting them in. She goes for her second surgery next week. Have a great day!! Happy Labor Day!! I am going to post my Tuesday 4 Meme. I am enjoying the long weekend. I got some of my Fall decorations out and cleaned house a little. Josh is at my mom and dad's and he is helping them clean house. I cannot wait to see it. My mom's eye surgery is Wednesday, so I will be spending a lot of time down there, I am hoping I can shampoo their carpets while I am there. I am hoping to do a little more cleaning today and then it is back to work tomorrow and I am off the rest of the week (wed-fri) for my mom's surgery to do her eye drops. It is raining here today and it is a welcome rain. It is really dry here. Have a wonderful Labor Day!!! My siggie is by Judy.